The single most important change in the character of a holiday by the sea in the post-war years is the growth of car ownership. In 1951, 47% of holiday makers went by train to their destination, 27% went by bus or coach and 27% by private car. By 1960, nearly half of the total number of holiday makers went by car and by the end of the 'sixties nearly 70%. The effect on the railway network was dramatic. In the 'sixties, Dr Beeching's axe fell on many coastal branch lines. Modernisation of the networks and a switch to all diesel or electric locomotives did little to halt the decline. BR had a hard job of selling rail travel to a public that had tasted the freedom that the motor car could bring. Advertisements for "Golden Rail Breaks" in 'seventies' seaside guide books looked remarkably unattractive to the motoring public. Paradoxically this opened up a new form of nostalgic holiday attraction. Once the era of steam was well and truly over, many of the disused branch lines were transferred to enthusiasts wanting to preserve steam locomotives. Many of these were at seaside towns. Whilst people no longer wanted to make their main journey by train, they were happy to relive the days of steam with a nostalgic trip along the coast. 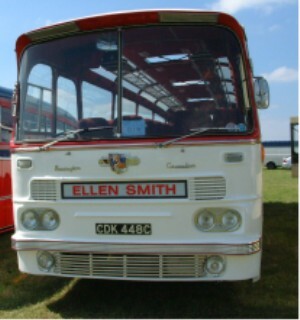 In the 'fifties, as well as the growth in the number of motorists, bus or coach travel also flourished. This was pioneered in the 'twenties and 'thirties, but grew in popularity in the 'fifties. Bus or coach travellers reached a peak of around eight million in the mid-fifties. This number tailed off in the 'sixties to around six million. 'Fifties buses were very stylish in design - featuring lots of chrome and beautifully trimmed interiors. The 'sixties brought real luxury and the now familiar large front windscreen, affording a panoramic view to the passengers as well as the driver. Many official guides to seaside towns, in the 'sixties, contained a section on how to get to the town. Generally there were details of train times, cost of fares and information about bus travel. Unusually there was also information on how to get to the area by air. Quite how many airborne visitors they were expecting is not mentioned. Most telling by its absence, however, is information on how to arrive at the town by car - the mode of transport favoured by over half of their visitors. Whilst it is true that the car has altered the landscape along the coast, it has at the same time, made that coast more accessible to people with modest means. In earlier times, the citizens of many established seaside towns viewed the railway with as much suspicion as the did the car. Bournemouth, for example, was nearly killed off in its prime as a holiday resort, when there was a movement to stop the railway reaching the town. There were people who felt that the town's main business lay with wealthy invalids and crowds arriving by train would put them off. Fortunately, the railway was allowed to come to Bournemouth and the town continued to flourish. The car brought the holiday maker a freedom never enjoyed before. He could stay in one place and use that as a base for touring the neighbouring countryside. He did not have to stay in a boarding house by the sea - he could find accommodation inland and drive to the coast. The growth in caravan and camping holidays is almost entirely due to the growth in road transport. A remote caravan park would not be in the least attractive without the car. It may be that the growth in car ownership actually encouraged people to stay at home (ie, in the UK) rather than go abroad. Surely a flight to Spain would have looked all the more attractive, if the alternative were a train trip to a major holiday resort where the holiday maker might still have to put up with all sorts of restrictions and be limited in his freedom. The motor car rather than becoming the enemy of the British Seaside might well have kept it alive for another twenty years. In the early 'sixties, motoring on holiday was by no means an easy option. Cars were more expensive to run than they are today. There were few motorways. The trip to the coast would have been a series of traffic jams between all of the major towns on the route. It is difficult to imagine now how much more difficult it was to get from home to the seaside by car in the 'sixties. The trip from Birmingham to Torquay involved only sixteen miles of motorway travel on the M5 - which ran out near Tewkesbury. Most of the route was the A38, which went straight through the centre of most towns between Birmingham and Exeter, save only Gloucester which was by-passed. It ended on the notorious Exeter by-pass which slipped into motoring legend and was a particular traffic black spot. At busy weekends, roads into the major resorts were chaotic. In August 1966, the RAC told reporters of the "Torbay Herald Express" that at 10am traffic was leaving the Exeter by-pass at the rate of 1,000 vehicles per hour and that homeward bound traffic was in a seven mile tailback at Telegraph Hill. In response to these jams, motorists left earlier and earlier. At 5am on the same weekend, traffic was leaving London Westwards at around 1500 vehicles an hour. A week earlier there had been less of a problem with drivers leaving South Devon because many cut their holidays short to be sure of seeing the World Cup on television. However, there were just as many motorists travelling to the coast. It was quite common in the early 'sixties for drivers to travel through the night to beat the jams. The RAC reported that early Saturday morning there were hundreds of cars parked on the grass verges of the major trunk roads into Devon and Cornwall, with the occupants asleep. An RAC spokesman reported that "the numbers of overnight travellers are increasing every year" and that "a steady stream of traffic had been pouring into the West Country all night." A common plan of action was to leave home at around 10pm on Friday and pass most of the major bottlenecks before the morning. The driver would then find a convenient lay-by to stop and sleep until dawn. That way he was well ahead of those setting out Saturday morning. Sometimes it was difficult to find somewhere to stop - the lay-bys were all full in the early hours of Saturday morning! That motorists were prepared to pay such a heavy price for taking their cars on holiday must suggest something about the advantages it gave them once there and the economy of using the car, once you had bought one, compared with train or bus. Relief was slowly brought to drivers heading South-West and to towns and villages on the favourite routes in the late 'sixties and early 'seventies. The M5 linked Birmingham and Bristol in December 1971. 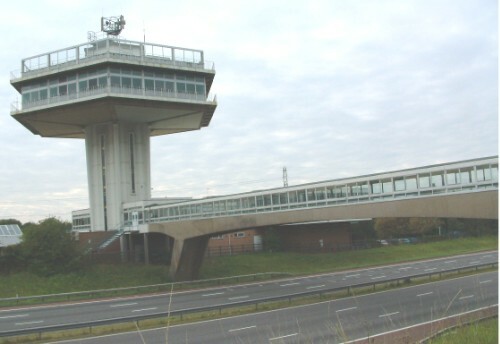 However, the Avonmouth Bridge, over the River Severn, allowing the motorway to pass West of Bristol, was held up by concerns about safety and had to be re-designed. It finally opened in May 1974. This meant that traffic heading West still had to go through the centre of Bristol, initially to pick up the A38, then latterly to pick up the M5. The Holiday Route's, which were published by the Department for the Environment, recommended that motorists crossed via Brunel's Clifton Suspension Bridge. The toll in the early seventies was 5p for cars. Caravans were not allowed. In spite of the delay with the Avonmouth Bridge, the M5 pushed South. One of the most outstanding engineering feats of the time was the section through the Clevedon Hills. The motorway cuts through the side of the hill at two levels. It is one of the most breathtaking sections of motorway in the UK. It was opened in January 1973. 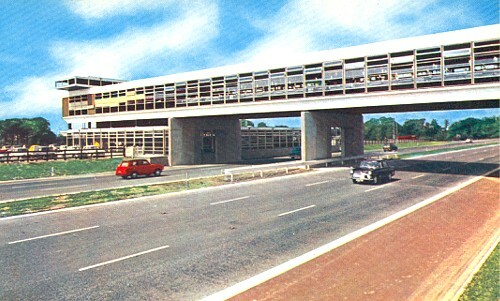 The M5 finally reached Exeter and by-passed the notorious Exeter by-pass in the mid-seventies. Now it was possible to travel from the Midlands to the West Country almost entirely by motorway. 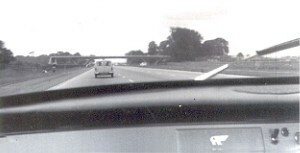 The M4 allowed a similar trip from London. In the North, the most popular holiday destination was still Blackpool. The newly built M6 and increased car ownership brought serious traffic problems to the A583, which runs from Preston to Blackpool. The road had a reputation as an accident black spot and suffered serious congestion in the 'sixties. A scheme to link the M6 to Blackpool, then known as the 'Blackpool Link', was proposed in 1963. A report produced to support the idea claimed that it would save around 500 accidents a year on that stretch of road in the Fylde area and in Preston. A further report produced in 1969 gave a figure of 376 fatal accidents that had occurred on the road to Blackpool since 1959. In spite of these warnings, there was a reluctance to proceed with a project aimed mainly at improving travel for holiday makers rather than industry. When the scheme was finally approved, a more acceptable name of "Preston Northern By-pass" was chosen. Construction started on what became the M55 in May 1973. It was opened to the public in July 1975 - in time for the Summer season. Just before the new road was opened, the empty motorway was put to another use. BAC had been developing a new fighter aircraft, the Jaguar, for the RAF. They wanted to demonstrate the aircraft's ability to land and take off in short distances and used the new M55 for the demonstration! Motorway travel brought with it an entirely new holiday experience. I personally cannot remember holidays before the motorway. I can remember travelling on the M5 from the Midlands to the West Country when it was almost new. Derelict cottages dotted the edge of the brand new road, abandoned in the wake of progress. A stop at the motorway service station became part of the excitement of going away. Even today I still associate service stations with the thrill of holidays in the 'seventies. I remember stopping at Michaelwood on the M5 heading South. It was opened in 1971, and then run by Mobil. The next stop was Gordano, opened in 1973,then run by Fortes. Another favourite stop of mine is Rownhams on the M27, which was opened in 1977 (Roadchef then and still is today). Further up the M6, nearer to Morecambe, is Forton (right). Forton was operated by Top Rank. They wanted to create a service area that would not only attract passing motorists, but would also attract diners from Blackpool and Preston. The centre piece of the service area is a hexagonal tower, which housed an up-market restaurant in the 'sixties. The tower was on the Northbound carriage way, but was accessible from both sides by a bridge. One of the most picturesque stops was Aust on the M4. It was opened in 1966 and was run by operator Top Rank. 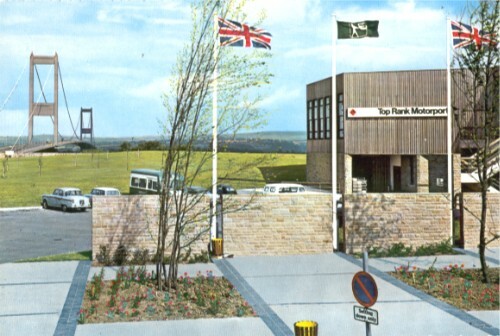 It was then called a "Top Rank Motorport". Diners in the restaurant had views of the River Severn and the Severn Bridge. Today the service station is called "Severn View" and that stretch of the M4 is now the M48. The Severn Bridge itself was one of the great engineering achievements of the 'sixties. A crossing at this point had confounded previous generations. There were designs by Telford and Brunel for a bridge here, but these were never built. The strong currents of the Severn made it a particularly difficult task. In 1968, the Consumers' Association ("Which") did a report on motorway service areas. The sent out a team comprising two "Good Food Guide" Inspectors, a family with small children ("experts in travel weariness") and a Car Test Unit to check facilities for looking after the car. The conclusions were generally good. The service areas were found to be clean and the lavatories spotless. Strangely enough, although the lavatories were free, they often charged between 4d and 6d for paper towels. The food was quite acceptable to the family, but did not come up to the standards expected by the "Good Food Guide" team. In spite of the pretensions of some of the service area restaurants, they were only considered "average" or "fair" by the inspectors. There was one exception, Leicester Forest East, on the M1 run by Ross Frozen Foods, which had an exceptional restaurant - "The Captain's Table" which the inspectors rated at "good". At the time it was a popular venue as a restaurant as well as a service area. A typical meal a the motorway services cost from around 4s 6d to up to 16s. Many people felt these prices were expensive and brought their own sandwiches to eat in the car park - only taking advantage of the lavatories! Can be found in the book "Always a welcome - the glove compartment history of the motorway service area" by David Lawrence. This is a fascinating read. I have not been able to put it down since buying a copy. The book explains the reasons behind the changing style of the motorway service station in an entertaining and easy to read manner. (Published by "Between Books" ISBN 0-9536980-0-9). The "Which" report - "Motorway Service Areas" was published by "Motoring Which" July 1968.